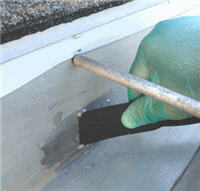 There is a lot of confusion and misinformation when it comes to the sealing of gutters, and particularly what to use. Sealers break down over time, seams and joints expand and contract. Many times, installers fail to seal the connections right. If there is silicone on the existing joint or seam, either it will have to be re-applied or removed entirely for a new type to be put on. Silicone is incompatible with other products, and other sealers are sensitive to it. For gutters that are vinyl, galvanized, or made of aluminum coil stock, one excellent sealer is Geocel, made in aluminum grey (available at gutter and roofing supply outlets). Applying this tripolymer on a clean dry surface is best, however it is possible to apply it in wet conditions. Take efforts to clean the surface, removing grime and mildew. Any corrosion is removed by first wire brushing and any rust, with emory cloth. Wearing protective plastic gloves, press the sealer on from a warm tube (at least room temperature) with a small plastic spreader. Cleanup with lacquer thinner or xylene, and toss the gloves and the spreader. Read all warnings. This is a powerful product. 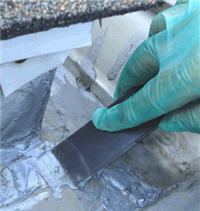 While it is possible to patch holes from gutter-spikes, only those up to 1/4" are recommended. The first application will settle into the hole, drying concave. When it is dry apply the second layer. For gaping holes on the gutter floor; sand the areas and let dry before applying a self-adhesive metal patch (comes in 3 x 6" pre-cuts) or else a cut of metal asfixed with roofing cement. The most weathertight answer, of course, is to replace these sections.